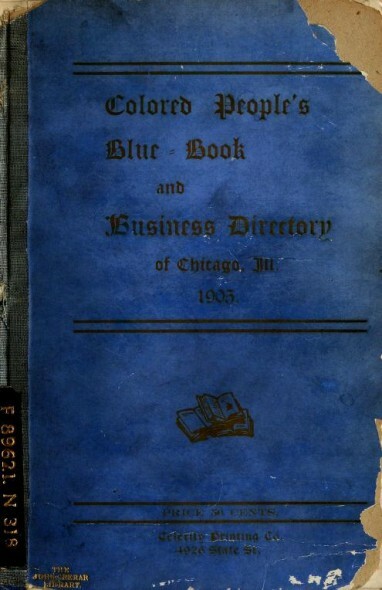 I could find little on the author of this business directory, which was published privately in 1905, but the directory itself is a goldmine of social history. To give a little context, Chicago was one of the destinations for African-Americans during the Great Migration; morever, the city was founded by a Haitian fur trader in the 18th century, and post-Civil War Illinois was progressive in its anti-discrimination and segregation laws. Nevetheless, in a big city such as Chicago, segregation was rife, and African-Americans settled in the “Black Belt,” or the neighborhoods on Chicago’s South Side. 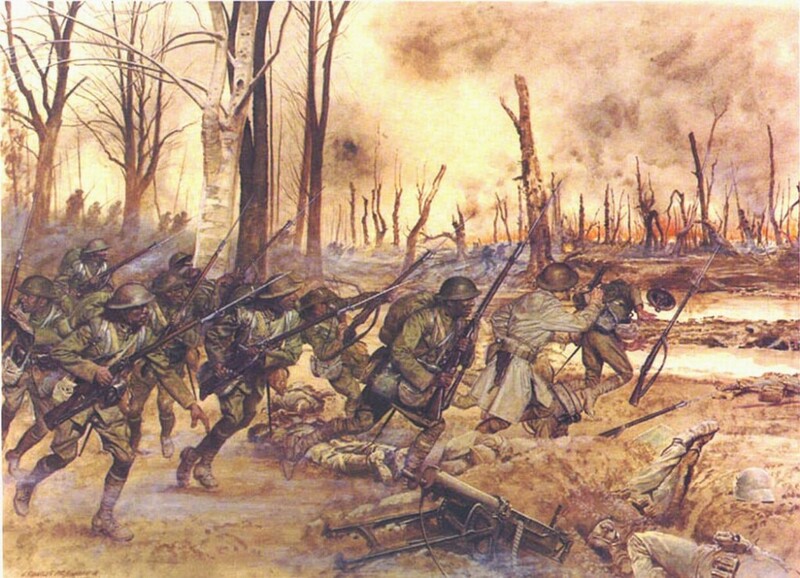 There, well-to-do, middle-class, lower-class, and poor African-Americans lived cheek-by-jowl, surviving and thriving in less than ideal circumstances. However, a quick glance through this directory reveals pages of industries in which Chicago’s African-Americans were involved: from restaurants to dentistry, newspapers to millinery, and law to laundries. A lone entry that stokes my imagination is that of Madam Pearl Black, a Clairvoyant–one can only ponder what sort of fortunes she gave her clientele! Or download it for future perusal here. However, Alonzo Herndon’s most indelible mark was the opulent barbership located, as mentioned above, on 66 Peachtree Street. After the death of his first wife, Herndon soon remarried again (Jessie Gillespie), and they honeymooned in Europe. Herndon was inspired by the sights and elegance of the “Old World,” and returned to Atlanta full of plans to transform the three-story building, which spread an entire block from Peachtree to Broad, into a palace. 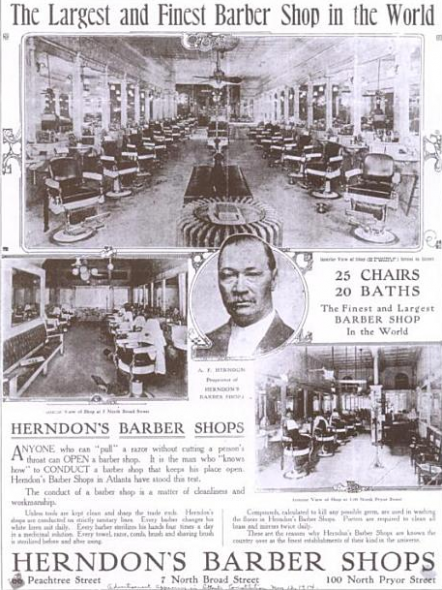 By the spring of 1913, Herndon Barbershop had become the Crystal Palace. The Crystal Palace became known from Richmond, Virginia to Mobile, Alabama as the best barbershop in the South, and became an unofficial city attraction visited by local Atlantans as well as tourists who reveled in its opulence. Herndon also counteracted Jim Crow laws by designing his back entrance that looked the same as the front! By the time of Herndon’s death in 1927, Atlanta Life, which he funded with the profits of his barbershops, expanded into one of black Atlanta’s premiere institutions with assets totaling over one million dollars. His son Norris further expanded the insurance business into a multi-million dollar company, which–along with the Herndon mansion–still exists to this day.